D.C. Jericho is an affiliate with seasoned workers around the issue of political prisoners and mass incarceration. We put on the Nov. 1st Assata Shakur Liberation and Education Day Celebration. 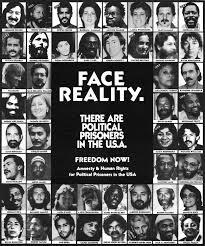 We are actively looking for friends and comrades to join us in our monthly pot luck-letter writting event and to organize events that will broaden our community knowledge of the struggle of u.s. held political prisoners for Freedom and Clemency. The DC National Lawyers Guild is honored to recognize Katherine “Shelley” Broderick, dean of The University of the District of Columbia David A. Clarke School of Law, for her truly exceptional leadership and contributions to the DC legal community. Join Dean Broderick and other guests of honor to steep in the politically progressive and comradely brew that is the DC chapter. All our welcome - old and new members, friends, and allies of the Guild. We will celebrate our recent and historical victories and continue to build our community. Always looking to the future. Tickets are $40 (proceeds to benefit the DC NLG) and are available for purchase through Eventbrite (http://www.eventbrite.com/e/nlg-reception-tickets-16801231937). Please buy your tickets in advance and help us plan the right amount of appetizers to pre-order. The event will take place on the first floor of Bohemian Caverns, 2001 11th Street, NW DC, called Tap & Parlour, one block from the U Street stop of the green/yellow metro line.